We will be sharing some of the stories from artists and library staff who have been instrumental in our pilot project, The Art of Libraries, over the next few weeks, before we meet for a sharing event to learn and discuss the potential of libraries as creative, playful spaces. Read the stories here and find out more and about our sharing day on March 27th 2019 here. 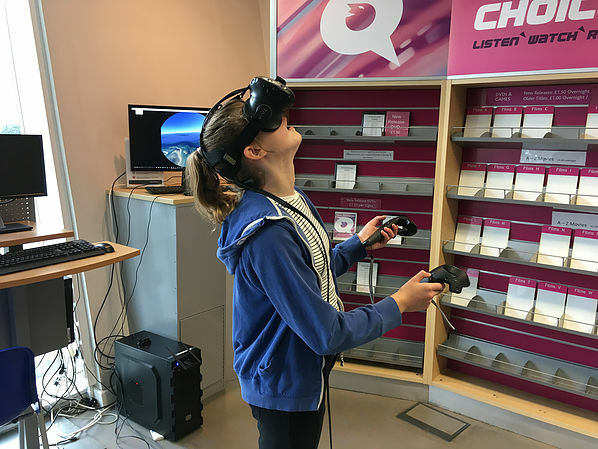 Can libraries in Gloucestershire be new places of “arts every day” for children and young people especially those who do not actively engage with the sector? Art of Libraries (AoL) is an exciting test programme led by Create Gloucestershire in partnership with Gloucestershire Libraries and Information, the Barnwood Trust and Real Ideas Organisation. With support from Esmee Fairbairn Foundation, Arts Council England, Ernest Cook Trust, the Summerfield Trust and other local community funds over three years, the goal is to explore the potential for libraries to be hubs for introducing arts and culture to children and young people especially those who do not currently engage with the sector. Our guess is that if we can grow cultural “habits” from a very early stage in life, children will become adults who value art and culture as “every day”. Libraries are generally seen as trusted civic spaces, connecting people with ideas and offering free services for some of the most isolated or those suffering deprivation. They are located in rural and urban areas and everything in-between. So a perfect partner to test a new way of introducing children and young people to arts and culture. We have four early adopter libraries (increasing to six in year two) where we are doing a re-think and a “refresh” – weaving arts and cultural activity (everything from Virtual Reality, GPS embroidery, coding, music) with activities more associated with a library such as storytelling and reading. The goal is a change in mindsets so libraries aren’t just seen as a “hush” space, but a place to play, experiment and be creative. There are artists working as change agents (our Creative Catalyst team) in each library, building relationships, discovering what does and doesn’t work and sharing this with a whole set of people. With an interesting mix of backgrounds, skillsets and producing experience connected to Blast Theory and Watershed’s Pervasive Media Studio to aerial and outdoor performance work; they are the vital catalyst to this new way of working. With a blend of leadership and facilitation, mentoring and enabling the Creative Catalysts (CC) build capacity and confidence within the team of library staff so that we are able to explore if our change model can become “business as usual” when the funding ends. “Change making is a slow process, the seed is planted but it takes a while to grow … you need to work at the pace of the environment you are working in and look at things from different perspectives”. "I feel that community engagement role is key to any successful project within our library and community. Matson has for many years held a negative stigma to people who don’t live within the community. This impression feels unjust because Matson is a close knit community and a pleasure to work within however changing perceptions are difficult....The library needs to be customer led and we need to learn to constantly engage and listen. My role is to help change people's perceptions of a “Hush Hush” environment and reinvent our environment as fun and as a safe haven". "A large part of the work I am doing is about getting people to see things in a new way and to get them to work in broader ways ....? It’s a process and I need to find ways to ask questions to help move things along as well as building on what is already there"
Success will be determined by the new relationships we can grow around the pilot libraries so that library staff sit within a dynamic network of artists, cultural organisations, schools, parents and community activists, committed to offering a distinct but complementary space for children and young people to explore, play, take risks and experiment. Have a look at what is happening in other areas, we’re interested in Libraries Unlimited South West and St.Helens Cultural Hubs. South Gloucestershire has a new resource, An Adventurer’s Companion available, particularly aimed at those supporting participants with low mood, depression or dementia through its library network and online at www.creativelibraries.org.uk. Can’t Sit Still were delighted to bring our new show, Plink & Boo, to both Matson and Gloucester Libraries as a ‘test’ partnership between the Art of Libraries Programme, run by Create Gloucestershire with Gloucestershire Libraries Service, and the GL4/Strike A Light Festivals. At the end of March last year, a rather unusual event took place in Dursley library; after the doors closed for the evening, the Dursley team, the creative catalyst and selected members of the Dursley community embarked on two hours of mindreading training! The Creative Mothers programme is an initiative between Art of Libraries and artist Lizzie Philps, supported by Procreate Projects and inspired by the Mother House Studio. In the first of our blogs leading up to the Art of Libraries Celebration and Learning event we would like to share the experience of Feral Productions when they tested out a new version of their production of Follow Me in Coleford and Lydney Library in the Forest of Dean. Check out the Facebook page, Hush Hush for up to date information on creative activities, opportunities and ways to have a voice in your library.